so that you can benefit from it without waiting until all is done. The first version was available since December 15, 2017. You can buy the ebook now for a reduced price and get all updates for free. See below for how much currently is covered. 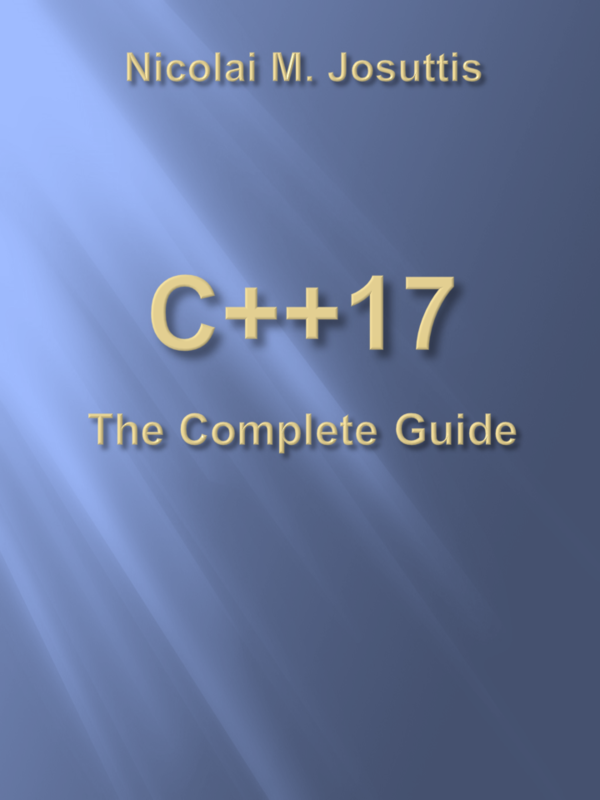 C++17 is the next evolution in modern C++ programming, which is already at least partially supported by the latest version of gcc, clang, and Visual C++. Although it is not as big a step as C++11, it contains a large number of small and valuable language and library features, which again will change the way we program in C++. This applies to both application programers and programmers providing foundation libraries. This book will present all the new language and library features in C++17. It will cover the motivation and context of each new feature with examples and background information. As usual for books by Nicolai Josuttis, the focus lies on the application of the new features in practice and will demonstrate how features impact day-to-day programming and how to benefit from them in projects. Nicolai M. Josuttis is an independent technical consultant who designs mid-sized and large software systems for the telecommunication, traffic, finance, and manufacturing industries. For almost 20 years he is a member of the C++ Standard Committee (library working group). He is well known in the programming community for his authoritative books. In addition to The C++ Standard Library, a worldwide best-seller since its first publication in 1999, his books include C++ Templates: The Complete Guide (with David Vandevoorde and Doug Gregor, Addison-Wesley, 2017) and SOA in Practice: The Art of Distributed System Design (O'Reilly Media, 2007). "It's very clearly written and the examples are really helpful!" "I am thoroughly enjoying the book; I had skimmed the list of changes in C++17 several times before but until I started reading your book I had no idea how substantial the changes really were. It makes me wonder what I overlooked with previous updates! New Filesystem Library: 50 pages! Note that you can also book inhouse trainings about Modern C++ and C++17 (both the language and its standard library) .